Frank's Gentlemen's Salon champions the time-honored traditions of a classic barber shop. A space dedicated for men to relax, freshen their style, & be pampered. We provide detailed hair cuts, precise straight razor shaves, along with an array of spa services. Our product line includes hair styling products, skin treatments, & unique men's retail. Frank's was born in Greenville, SC & quickly became the leader in men's hair care & spa services. 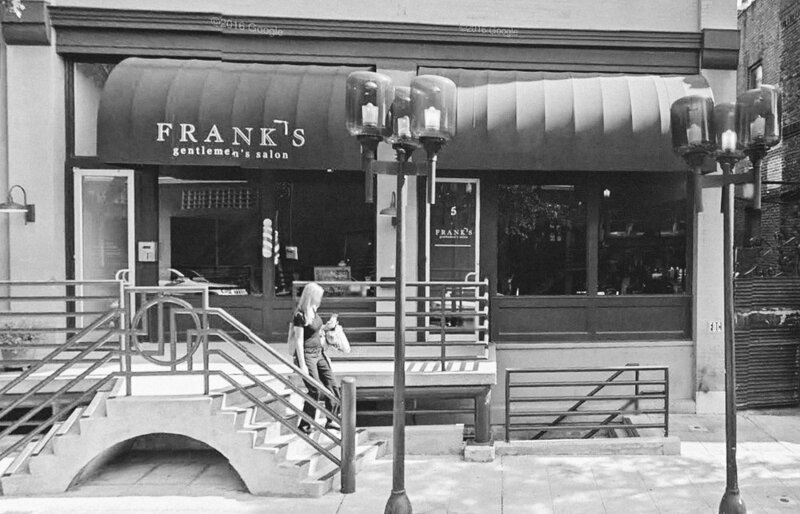 Now with two locations in Greenville, Frank's has expanded to Columbia, SC, Denver, CO, & coming soon Charleston, SC. Each space embraces it's community while still providing exceptional barber, salon, & spa services. IT'S NOT JUST AN APPOINTMENT, IT'S AN EXPERIENCE. Since 2012, Frank's Gentlemen's Salon has offered men a place to receive detailed haircuts, straight-razor shaves, classic shoe shines, & luxury spa treatments. Before seeing our staff enjoy our lounge that provides a space for men to relax, catch the game, or check emails with a beer or bourbon. A series of creams and oils are applied to maintain clean and healthy nails with a hand and arm massage. A rejuvenating 30-minute appointment. Indulge in this treatment that pampers your calves and feet, and cares for your nails. A luxurious foot massage is included to make you feel like a king for a day. Treat your skin for half an hour to a cleansing, toning, exfoliating, and moisturizing treatment. Our facial concludes with a facial massage sure to have you feeling 20 years younger. This one hour facial leaves your skin feeling cleaned, moisturized, and refreshed after our signature steaming process. This service includes a thorough cleanse, exfoliation, facial massage, mask, serum, and moisturizer. A hand, shoulder, and neck massage puts a finishing touch on this one of a kind experience. Begin by relaxing while our steam process preps the skin for our double cleanse and beard wash. A gentle exfoliant is then applied, followed by a high frequency current treatment. This eliminates any bacteria on or just below the skin's surface and stimulates blood flow and collagen production. A mask specific to your skin type is applied followed by an antioxidant serum and a hot towel face wrap. We finish with a rejuvenating facial massage and a conditioning beard oil and moisturizer leaving your beard and skin feeling brand new. Available at our Greenville & Columbia locations. All natural essential oils are used to massage away tension in neck and shoulders. Consists of an invigorating shampoo and revitalizing conditioner. Your scalp is thoroughly massaged while conditioning treatment revives your hair. This experience includes professional consultation, invigorating scalp massage, shampoo with hot towel facial wrap followed by a precision haircut. Also includes a traditional straight-edge neck shave and neck and shoulder massage. Complimentary clean up in between appointments. This process begins with a facial cleanser to prepare the face for our regiment of hot and cold towels followed by shave products and concluding with a relaxing facial massage. Maintain your beard’s shape and keep your look clean and tidy. Touch up your gray with this natural-looking hair color that blends with your own hair. Let us shape and maintain your eyebrows. Feel great knowing your child is in good hands with our talented stylists. Service includes shampoo and style. For ages 12 and under. Let an expert clean and care for your shoe investment. Stop by for a clean-up in between appointment to ensure you always look your best. No appointment is required. Look your best before the big day by letting Frank’s host a private groomsmen party! You and your groomsmen will have the entire salon to yourselves to get ready before the wedding. Our full menu of services are available to make you and your groomsmen picture perfect. We recommend booking in advance to reserve the date and time you wish. A 50% deposit is required at the time of booking, with the remainder due the day of the party. For more information and to book your party, please stop by for a tour or give us a call.